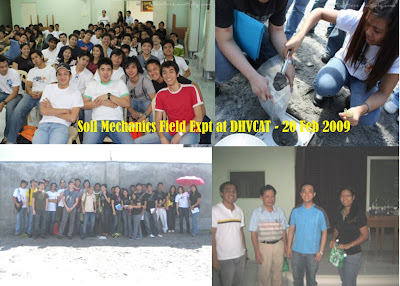 Last February 20, 2009, the third year civil engineering students together with the students of Don Honorio Ventura College of Arts and Trades (DHVCAT) conducted an experiment in Soil Mechanics, which is the determination of a Unit Weight of Soil in Place by the Sand-Cone Method (ASTM D1556). 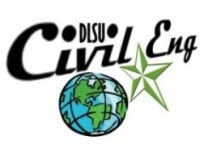 This activity is a tie-up project in connection with the Adopt-an-Eng-School Program of the CE Department and CES. The activity started with a lecture and demonstration by Dr. Jonathan Dungca, DLSU Soil Mechanics professor and CES student, Chesca Del Castillo. The DLSU and DHVCAT students were then divided into four groups to perform the experiment. 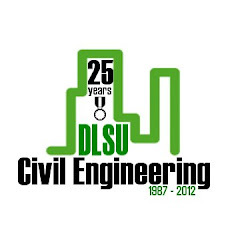 The equipment and materials such as the sand-cone apparatus, shovel, plate, bottle, Ottawa sand were provided by the DLSU CE Department. This activity is both a field trip and an alternative class for the DLSU students. Through this activity, both DLSU and DHVCAT students learned how to determine soil properties in situ. Report by Malyn Arigo. 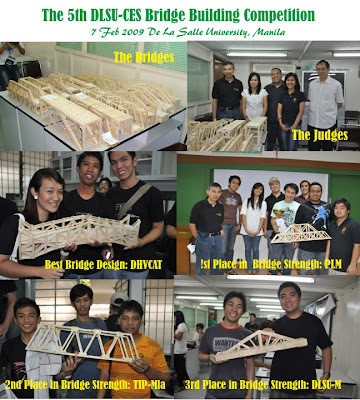 The 5th DLSU Bridge Building Competition was held on Feb 7, 2009. Seventeen bridges made from popsicle stick bridges were submitted from various engineering schools - Don Honorio Ventura College of Arts and Trades (DHVCAT), Technological Institute of the Philippines (Manila and QC), FEATI University, Far Eastern University (FEU) , Pamantasan ng Lungsod ng Maynila (PLM), University of the East (UE-Manila) and De La Salle University (DLSU-Manila). The bridge must span a distance of 560 mm and must have a width not more than 140 mm, height not more than 200 mm, depth not more than 100 mm, weight not more than 1.50 kg. There were two categories in the competition: Bridge Design and Bridge Strength. In the Bridge Design category, the criteria used were creativity, innovativeness, application of bridge design principles, practicality, implementability and neatness. The winner for this categroy is one of the entries from DHVCAT. In the Bridge Strength category, the bridges were tested using the UTM and the load P and deflection D at failure and the bridge weight W were used to get the Strength Rating (see blog on bridge testing). 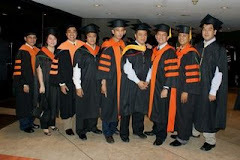 The winners in this category were 1st: PLM, 2nd: TIP-Manila and 3rd: DLSU-Manila. View Photos at Photobucket (photos by AWCO) and CES website (photos by Joenel G). 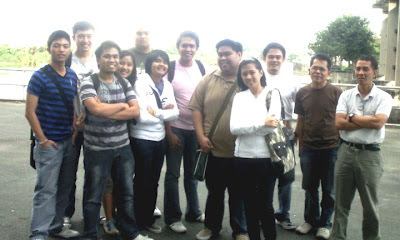 On January 15, 2009, the HWR 4th year students went on a field trip for the subject, RICOSEN (River and Coastal Engineering) under Dr. Danilo Terante. 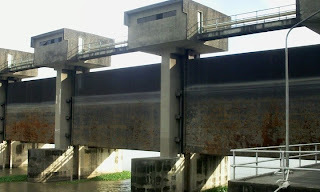 They went to the Flood Control and Sabo Engineering Center in Pasig City. This is the center where they control the flow of water through Pasig River. This is also the place where various experiments regarding water flow in the Lahar area in Pampanga and other river systems are being conducted. Most if not all of the apparatus in the center are also available back in La Salle, but the difference is that they are way much bigger than the one’s in school; the students were awed to actually fit inside these apparatus. One student even joked about having a shower party in the gigantic Rainfall Simulator Apparatus. Report by Carbert Lee.